Mary Queen of Scots was known to be playing golf in the area of Longniddry in 1567 – ‘over the fields of Seton’ – shortly after the murder of Darnley and was admonished accordingly! It was another two hundred years, however, before the 7th Earl of Wemyss & March bought land at Gosford ‘to be nearer the golf’ and a further one hundred and fifty years before the 11th Earl of Wemyss invited Harry S. Colt to design and build 18 holes. 150 acres were made available and thousands of trees were cleared to create a course measuring some 6,369 yards. Some of the felling occurred in (what was) the Boglehill Wood, thought to be a site of worship for local witches and warlocks and now the site of the 6th and 10th greens. The photograph above commemorates the inaugural match shortly after the course opened in 1921 when James Braid & Ted Ray took on JH Taylor & Abe Mitchell in a 36 hole fourball match. 4000 spectators were estimated to have watched the match between these four famous professionals, including two of the Great Triumvirate, the third being Harry Vardon. Braid & Ray shot 70 & 67 against the 71 & 73 of Taylor & Mitchell to win the match. According to Braid’s ledger, he received £10 in either appearance or prize money. The four professionals are in the second row of the photo, with George Taylor Longniddry’s first professional, second from the left. In the middle, wearing a bow-tie is Stuart Forsyth, proprietor of retailers RW Forsyth which had prestigious stores in Edinburgh & Glasgow. Stuart Forsyth was elected in 1935 as the first Captain of Longniddry Golf Club. The 11th Earl & Countess of Wemyss are in the front row. There have been a number of alterations to Harry Colt’s original layout. 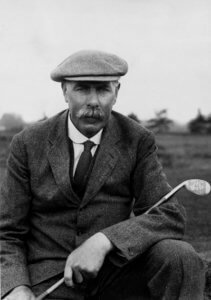 In 1936, James Braid was invited to advise on the second hole, following which a number of changes were made to the course, although none, it would appear, to the second! Braid’s ledger records that he received a payment of £26 for his services. During the war part of the course was ploughed up for food production, following which Philip Mackenzie Ross was invited to make good the damage and in 1945 the course was redesigned. Some of the changes were quite significant, with two holes by the sea being scrapped. More recently Donald Steele was engaged to advise on the course architecture, particularly the bunkering. Many of the original cross-bunkers were removed, or to be more precise, relocated! The course now occupies a modest 106 acres and measures 6,230 yards, but with four of the most celebrated course architects having left their distinguished mark, it is always a joy to play. The connection with the Wemyss and March Estate remains. 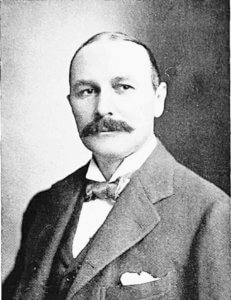 The Club’s President is the Right Honourable the (13th) Earl of Wemyss and March, K.T., LL.D., J.P.
has been published and copies may be obtained by writing to the Secretary. Formed in 1921, Longniddry Golf Club in East Lothian the cradle of golf, is situated on the south shore of the Firth of Forth, arguably the finest stretch of golfing coastline in Scotland, 18 miles east of Edinburgh. Longniddry is the closest seaside course to Edinburgh, comprising an unusual combination of woodland and links, with spectacular sea views from many holes. Designed by Harry S Colt, with no par 5s and 8 par 4s measuring over 400 yards, Longniddry offers a very good test of golf for both members and visitors who come to enjoy some of the best golf available in Scotland. The course has a par of 68 and the course record of 62 was set by amateur Mike Thomson of Peebles. Formerly an Open qualifying course, Longniddry is regularly asked to host amateur competitions such as the South East District Championship for the Lothians Golf Association which was held in September 2012 and in May 2013, Longniddry hosted the Scottish Ladies (Close) Amateur Championship. Longniddry will also be the venue for a Junior Tour event in March 2015.